A monographic study of the Christian Parthenon is long overdue. It is ironic that Kaldellis' bold and provocative book was published simultaneously with the pompous inauguration of the New Acropolis Museum at Athens, a cultural institution that decisively concretizes the Parthenon as the great masterpiece of Classical Antiquity. Kaldellis is a byzantinist who takes issue with this monolithic and fictional construction of the Parthenon in both popular and scholarly imagination since the eighteenth century. His argument is that the perceptual filters of Classicism, distorting, disorienting, and culturally contingent as they have always been, have diverted attention from the illustrious career of the monument as a Christian church. Consequently he sets out to rehabilitate the monument in its former, hitherto neglected glory as a pilgrimage site of universal appeal and as a focus of attention, cult, and intellectual preoccupation that have no match in Classical antiquity. He does so with expository verve and an often polemical tone that militates against the prevalent neglect and misunderstanding of the rich intellectual heritage of Medieval Hellenism. It is time we discovered the riches and complexity of post-antique Hellenism, Kaldellis argues. His book provides a paradigm for how to go about this, especially how to formulate questions and methods of approach that defy the suspicious assumption that Hellenism after antiquity was orientally decadent, derivative, and second-rate. It is no accident that this revisionist project has to start with the Parthenon. At once a blessing and a curse, this tyrant of a monument has to be deconstructed along with all the ideologies it has come to epitomize in Western civilization. The undertaking is daunting, but Kaldellis's book shows that it is well worth the effort. Kaldellis draws mainly from textual sources such as hagiography, epistolary documents, and homiletic texts--often fragmentary and obscure remnants of a much richer archive that several layers of catastrophes and reversals have condemned to oblivion. He has also made judicious usage of archaeological evidence that sheds light on various aspects of the history of the Parthenon from Late Antiquity until the beginning of the Frankish occupation of Athens. Given that the history of the Parthenon is inextricable from that of the surrounding city, this book is also a valuable contribution to the medieval history of Athens, even as a wealth of archaeological information still awaits publication (e.g. the Byzantine layers of occupation in the Athenian Agora area). It is noteworthy for its decisive effort to shake the established conception of Athens as a sluggish cultural backwater at the margins of the Eastern Roman empire. On the contrary, Kaldellis argues, local memory, the very radiance of the Parthenon, and the landscape of the city itself were conducive to the creation of uniquely local attitudes in which the Classical past was carefully re-inscribed in the framework of a Christian universe. Fraught with conceptual antinomies, constant tensions, and contradictions, this re-inscription forms the backbone of Kaldellis' project--it is also the crux of a cultural debate that continues uninterrupted to this day. Kaldellis unfurls his analysis of the Christian Parthenon with a provocative argument. He seems to think that in the Middle Ages the Parthenon/church was much more significant to many more people than it had ever been at any single moment in antiquity. In the last two hundred years or so, Kaldellis argues, scholars and others have carved a completely false image of the importance of the Parthenon in antiquity. Instead, he claims, "...the Parthenon, as a church, was more important than it had been as a temple. It was only in Byzantium that Athens was often identified with its cathedral; that people came from all around for the sole purpose of worshiping there; that the Parthenon eclipsed all other monumental sights in the city (of which there were still many); and that many described the building in superlative and miraculous language". He juxtaposes the Parthenon/temple to the Parthenon/church. The former he sees as an essentially hegemonic monument with restricted appeal and intellectual or even aesthetic consequence. The latter, on the other hand, emerges in Kaldellis' analysis as the focus of international pilgrimage, imbued with the transcendental grace and attractiveness of the Theotokos, its new Parthenos, and the subliminal impact of the antique and classical. It was the ideology of Classicism, Kaldellis claims, that placed the Parthenon at the pinnacle of European civilization in order to assert this civilization's cultural, political, and intellectual superiority in the history of humanity. Kaldellis finds no evidence that the Parthenon really enjoyed a commensurate centrality in ancient thought and life. It was not exceptional. Instead, Kaldellis sees it as marginal, at best debatable, a monument that never became a universal symbol or point of reference as it did in Byzantium. But precisely because Byzantium was Christian Orthodox, "oriental", and metaphysically oriented according to Kaldellis, it fell by default outside this cultural economy of classicing Eurocentrism. As a result, the Christian universality of the Parthenon and its aesthetic valorization and appreciation in the medieval period remained obscure and subject to a long chain of Orientalist prejudices. Productive though this critical framework may be, it is not without some problems. As Kaldellis rightly argues, the post-Enlightment Parthenon is indeed both a literal and metaphoric construct. On the other hand, Kaldellis is all too quick to dismiss a wealth of non-textual evidence that points decisively to the range and intensity of the monument's impact and valorization in antiquity. This evidence is as vast as it is often elusive and still not properly studied, precisely because until very recently the analysis of the Parthenon (and the Classical phenomenon) was premised on its capacity to embody a great number of essential, ahistorical, and universal forces and values. Moreover, Kaldellis's retrojective projection of pilgrimage as a qualifying criterion for the monument's significance in antiquity is no less guilty of anachronism as it is dangerous and misleading (see. esp. p. 14). Would anyone claim that the monument is more important in modernity because it receives hundreds of thousands of visitors from all over the world? On the basis of this foundational background, Kaldellis proceeds to unravel the hitherto neglected history of the Christian Parthenon. This is a veritable rehabilitation project and Kaldellis has done it very well. The story he tells ends up with the arrival of the Franks in Athens in 1204. The post-antique career of the Parthenon starts at the moment of its conversion into a Christian church. The evidence is scant but the fact, Kaldellis warns us, that a great deal of its sculptural decoration did survive should deflect attention from the usual imagery of Christian fanatics defacing the east, north, and west metopes (incidentally a cause of bad blood between the Greek Orthodox church and the museum administration in the wake of the inauguration of the New Acropolis Museum). 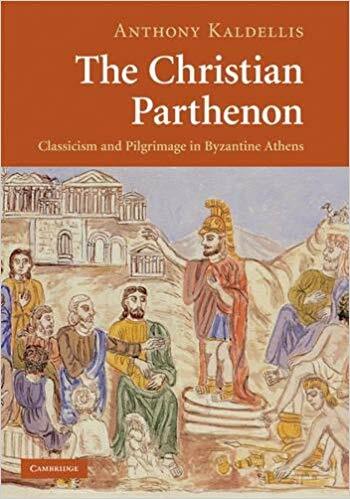 Instead Kaldellis admonishes his readers to ask "...how did Byzantine worshipers and pilgrims to the Christian Parthenon perceive [the surviving sculptures on the Parthenon such as those of the West pediment]?". 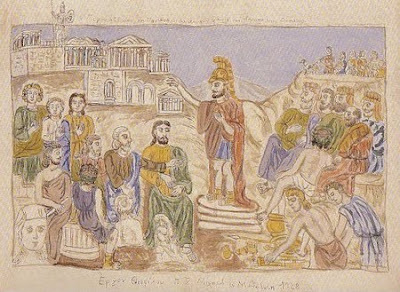 Kaldellis carefully speculates that in a city that witnessed generations of classically educated Christians a middle ground was possible: preservation, or even appreciation of the blatantly pagan apparatus of the Parthenon was not impossible in the cultural milieu of late antique Athens. In the subsequent centuries Kaldellis unearths a wealth of evidence that conclusively shows that antiquity constantly provided a lively framework for the articulation of Athenian identity. For the following few centuries Kaldellis painstakingly analyses a number of obscure and secondary sources (e.g. vitae of saints) in order to argue that the Parthenon gradually emerged as a pilgrimage site between the seventh and tenth centuries. The sources are very problematic and Kaldellis struggles to squeeze reliable information from them regarding pilgrims and patterns of pilgrimage traffic to Athens. His results, albeit impressionistic, are convincing but one is left with even more questions. There is no evidence whatsoever about the Athenian profile of the Theotokos and the new landscape of sacredness in which she and the pagan relic of the Parthenon came to dominate. One wonders, for example, about the symbiotic relationship of the Parthenon/church with the good number of Christian establishments on top of or around the rock of the Acropolis (e.g. the Asklepieion, interestingly enough dedicated to the healing Saints Kosmas and Damianos) and surrounding areas. Despite Kaldellis' effort to stress the Parthenon/church's singularity as a focus of pilgrimage, the Leonides basilica and adjacent martyrion near the Ilissos river must have been equally important and attractive sites; one suspects that the Parthenon/church existed in a socially complicated and perhaps multilayered network of movement toward sacred sites. Kaldellis is in more secure ground, nevertheless, when he turns to the extraordinary corpus of the Christian inscriptions on the Parthenon. Numerous prayers, epitaphs of prominent ecclesiastics, and names of laymen started being inscribed on the monument ca. 600, thus attesting to (but also shaping) the building's centrality in Athenian cultic life for several centuries. It may well be, Kaldellis hypothesizes, that "the insistence of the Parthenon inscriptions on personal names has more in common with ancient habits than with those of Christians in late antiquity" . No matter how we interpret this epigraphic habit, it rendered the Parthenon an unparalleled repository of memory and entreaty. The life of the Parthenon/church emerges in much sharper relief from ca 1100 onward. Kaldellis makes good use of an ecclesiastical register of properties (πράκτικον) in order to reconstruct the topography of the city at the beginning of the twelfth century. This was a period of prosperity for Athens, one which witnessed the establishment of a good number of churches--the humbly sumptuous and elegant specimens of an Athenian school of architecture that seem to have rivaled in subtle, yet distinct, ways the grandiose creations of Constantinople. Kaldellis bypasses these important monuments, and this is rather awkward because they still set the backdrop of normalcy against which the Parthenon enjoyed its unique and formidable status as home to the Theotokos (now crystallized as "Athenaïs" or "Atheniotissa"), her cathedral, and a pilgrimage center of universal fame and appeal. Constantinople also was the spiritual home of many pious ecclesiastic leaders who arrived in Athens armed with metropolitan snobbery and a very sophisticated apparatus of classical scholarship, only to find the harsh reality of ruins and a glory long gone. Some of them found solace in experiencing the Parthenon/church as a material affirmation of Christian triumph while others, e.g. the wise but tragically misplaced Metropolitan Michael Choniates or Akominatos, escaped to the irresistible magnetism of its classical aura and finesse. It is this idiosyncratic character of the building, Kaldellis argues, that accounts for the exceptionality of the Atheniotissa, her popularity and attractiveness, her fame and universal appeal. The ancient building was "...not merely the flagship of the Theotokos cult but the very reason for its existence" (144). He sees the very materiality of the Parthenon as the indispensable, yet at the same time unattestable, precondition for the success and pervasiveness of the cult of the Atheniotissa. The argument is convincing despite the reticence of the relevant sources as to what precisely the medieval worshipers appreciated on the Parthenon. Kaldellis leaves no stone unturned to reconstruct the building's exterior and interior ambiance at a time when ecclesiastical buildings came to encapsulate the Christian universe in both their form and decoration. To what extent and how could this superb relic fit in the established theological symbolism of Eastern Roman empires' world order? It was in this period that a new apse was constructed and along with it a mosaic of the Theotokos (Kaldellis emphasizes that the process involved the careful dismantling of the frieze block with "peplos scene"). This new feature punctuated what must have been a truly bizarre interior. More importantly, the twelfth century witnessed the association of a frequently attested, yet frustratingly elusive, miraculous and ever-burning light with a "photocentric" conception of the Theotokos Atheniotissa--a well conceived attempt to enhance the cathedral's mystical aura. Interestingly enough Kaldellis hypothesizes that this may have been inspired by the ever-burning lamp by Kallimachos at the Erechtheion. This is possible in a climate of intense preoccupation and latent dialogues of both Athenians and outsiders with the classical past of Athens. On the other hand, one can not help thinking that this preoccupation with light is curiously concurrent with the important spiritual underpinnings of Abbot Suger of Saint-Denis (falsely identified with Dionysius the Areopagite in the Mediaeval period) regarding light and its transcendental qualities. Could this be pure coincidence only? Kaldellis' fascinating story of the Christian Parthenon ends grimly in 1204. The subsequent history of the Parthenon and Athens paints a very black canvas and largely accounts for the irretrievable loss of evidence regarding the period covered in this book. It is only to be hoped that others will follow Kaldellis' lead to unravel the life of the monument as a Latin Cathedral and later on as an impressive mosque. Kaldellis has done a superb job illuminating the vitality and complexity of attitudes toward the Parthenon in the Middle Ages. The book should be read carefully not only by Medievalists but also by Classical scholars who can no longer claim to be the primal stake holders in the preservation and study of the Parthenon phenomenon. Anthony Kaldellis, The Christian Parthenon: Classicism and Pilgrimage in Byzantine Athens. Cambridge/New York: Cambridge University Press, 2009. Pp. xiv, 252; ills. 26 b/w, 2 maps. ISBN 978-0-521-88228-6. $99.00.